Once again the oppressive heat of the European summer descended upon the paddock, after the chaotic storms of yesterday's qualifying saw a number of runners out of place for todays race. Notably, Daniel Ricciardo in P12 and Max Verstappen in P7 should make things interesting, if nothing else. Carlos Sainz in P5 along with Gasly P6 and Hartley P8 could also make things challenging for those wanting to move forward at one of THE most difficult tracks to overtake, 3rd hardest in terms of delta required for overtake according to the man himself, Lewis Hamilton, who very much hopes to be driving the bus once they clear T1 for the first time. In an interview yesterday, post qualifying, he suggested that even though Mercedes had serious issues with the rear tyres overheating on the Ultras, they would likely start on them despite having free choice of tyre compound (thanks to the wet quali) so as not to yield the advantage to Ferrari early on, and then just park it to keep them behind till they can bail on the compound. Obviously, from Ferrari's point of view, the best of all scenarios is for them to get ahead of Mercedes at the start, and the layout of the track will certainly aid them in that there's room around the outside in T3 if they get close enough and the decided advantage off the line they've shown over Mercedes makes it quite likely for a white knuckle start for fans of both teams. Beyond that, Ferrari will hope that they're ability to run long on the Ultras, as shown by Vettel in FP2, will gain them a pitstop over the Mercedes. So if they wind up behind after the start, look for them to push Mercedes hard enough to make them need 2 stops, then manage their own pace so as to need only 1. Lights Out!!!! Good start from Lewis, excellent from Sainz, on Vettel and almost by, as Bottas blocked off Raikkonen as he tried to make the move around T1. Sainz lost out, going down 4 places as Verstappen steamed up the inside, kissed wheels and took him wide, seizing control of P5. Vettel took advantage of Raikkonen's loss of momentum from Bottas and went round Kimi for P3. Sainz down to P8, and Verstappen up to P5, having gone inside Carlos and then taken him to the outside. Ricciardo lost 4 places with contact as Ericsson plowed into him, hemmed in on either side, and was down to P16 as his torrid weekend continued apace. But it was even worse news for Leclerc, out after contact with the Force India of Perez. K-Mag made the jump up to P7 off the start, another benificiary of Verstappen's move, and was giving Gasly a hard time as they headed off to lap 3 while both Toro Rossos had managed to stay in the top 10, though Hartley was down a spot. Lap 5 and Ricciardo reported a large vibration from the side where contact was made as the race began to settle. With the VSC lifted, RoGro, who lost a place at the start to Alonso, took it back, with Alonso radioing in that he felt the HAAS driver went early off the VSC.Given the lack of penalty, it might just have been down to a rare moment of inattention from the McLaren driver. Ricciardo was next up on the Spaniard's gearbox, and it took just a bit of effort for the Red Bull driver, down the straight to T1, with Danny Ricky getting it done out of T2 on lap 9. 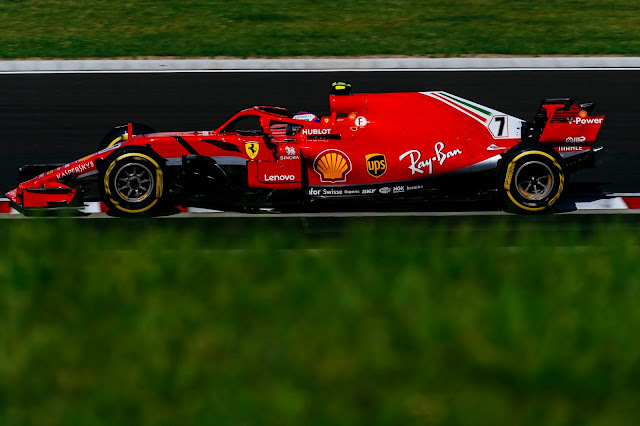 2 laps later, and there was a long, confusing radio communication between Ferrari and Raikkonen, the end result of which was it turned out Ferrari hadn't connected Kimi's drink bottle. Kind of an oopsie given the brutal heat, it has to be admitted. Raikkonen's concern was that the drink was emptying out somewhere and the team was just telling him to not hit the button and it wouldn't be a problem. Any port in a storm for entertainment. Lap 13 and Ricciardo continued to be the show, nabbing Hulkenberg to go P9. RoGro called in with overheating tyres and a bit of complaining about Ricciardo's tight move up the inside of T1. Two laps later Raikkonen kicked off the pitstop cascade, but it was disastrous, going long with a sticky left rear lug nut, 5 seconds in all for a new set of Softs. This put him out behind Kmag and pretty much ruined their strategy. Hamilton responded with fast lap as Mercedes brought Bottas in to cover, kicking him out on the Soft tyre, same as Raikkonen. The gap between the leaders then was almost 9 seconds, with Bottas no longer in the way. Lap 17 saw Raikkonen finally by Magnussen, and the question of whether Bottas was pitted to defend Raikkonen or pressure Vettel was open. Or possibly both. Ricciardo had continued his magnificent drive, and with a neat move on Carlos Sainz, who wasn't going to argue too seriously in any event, was into P7 and aiming at Kmag just up the road. Lap 20 was the crossover point at the top, with Vettel finally matching Hamilton's laptime on the slower tyre compound, though the gap was not changing in any significant way as the following lap ticked over. Thanks to the slow Raikkonen pitstop, Gasly was now running solidly in P4 as a multi-lap duel between Kmag and Ricky Danny unfolded. Ricciardo started out by making a number of feints up the inside, with Kmag covering them off. Into lap 21 he did the same, then crossed over and stuck it round the outside of T3 as Kmag left him room on the initial apex. 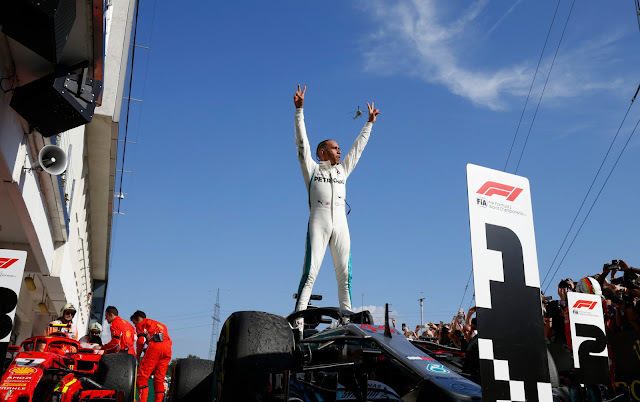 During that battle, Hamilton's laptimes were undergoing a drastic inflation, and lap 23 saw Lewis lose 1.5 seconds, although a chunk of that was due to having to lap Ericsson, with Stroll up next. Vettel locked up and chucked it wide into T12 on lap 24, costing him about a second. Still, Vettel was 0.6 seconds faster and the lead with down to 6.5 seconds. Raikkonen, too, had finally done the business on Gasly to retake P4, but it was costly indeed. Lap 26 and Hamilton was in, out on the Soft tyre, ahead of Bottas. Mercedes called the stop due to the fact that the upcoming lapped traffic in front of Lewis would drag his laptimes down and put him into Vettel's grasp. Bottas also seemed to be under pressure, as his early pitstop meant he was running times that put him behind Vettel on the road, with a long stint on the Softs to manage. Vettel was running roughly 0.5 seconds a lap faster and with a switch to the Ultras ahead, it was suddenly looking good for the Ferrari driver to take P2 and have a go at Hamilton at the conclusion of the race. Ricciardo made another, late lunge on the brakes the following lap to continue his race of redemption, by Gasly and into P5, making up not only for his poor qualifying but carrying the banner for Red Bull after the loss of Verstappen, whose sweary retirement mirrored the frustration expressed by Horner over the utter unreliability of the Renault powerplant. As Vettel continued to extend his stint, the possibility of a Safety Car, or Virtual Safety Car became a strategic hinge. Given the gap to Lewis, around 14 seconds, either would enable the Ferrari driver to be gifted a roughly free stop and almost certainly leave him in the lead. And yes, it's possibly a minor note of desperation that I'm writing this as the race continued, with all the runners basically holding station. Kmag was in lap 30 and out P9, with a slow stop but it was Raikkonen who had rowed into DRS of Bottas, who seemed to not be enjoying his time on the Softs all that much or was engaged in a tremendous bout of tyre managemet. Hamilton continued to match Vettel's times, at a gap of 14 seconds meaning when Vettel finally boxed, he would have roughly a 6 second gap to make up. The bigger question for Mercedes was what to do about Bottas if Raikkonen, now making better time than Valterri, got by him. Lap 35 and Gasly was in and out, back into P6 and best of the rest for Toro Rosso. Traffic was causing the gap to yo-yo between the top 2 runners, and for HAAS it was a bit of a disaster, as RoGro's stop had stuck him back out behind the long running Sainz-Ocon battle, and out of the points. Lap 37 and it was Vettel calling for blue flags, this time for Sainz and a certain note of hurry in his voice as Lewis had begun to chunk time out of him in rather larger pieces, 10 seconds between them and at the conclusion of the following lap, down to 9 as Lewis caught the train that had delayed Vettel. Lap 39 and Ferrari changed course, bringing Raikkonen in for another stop for a set of Softs and Bottas responded by putting a fast lap in and taking advantage of the lapped traffic, into Vettel's pit window, ignoring the provocation. In came Vettel, in a desperate attempt to head off this disaster, but it was just a lap too late, and he was out on the Ultras but crucially BEHIND Bottas. A sticky front left was the cause of the slightly slow stop, but the real culprit was the lapped traffic. Lap 41 and Vettel was into DRS on Bottas, and having a serious go and the possibility that Raikkonen's stop was an attempt to bait Mercedes into 2 stopping Bottas looked to be a plausible explanation, in order to keep him out of Vettel's window. 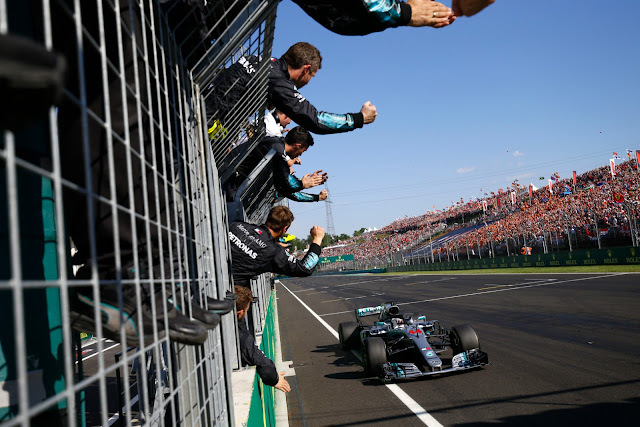 Vettel continued to yo-yo on Bottas, trying to manage his tyres to make the end whilst seeing his race disappear up the road as Hamilton continued to outpace the Mercedes, behind whom he was stuck. Lap 44 and Vettel was back into DRS and the gap from Bottas to Hamilton was, quel surprise, going right back out, up to 8 seconds and growing rapidly. Ricciardo was in the following lap, and out on a set of Ultras with Raikkonen 12 seconds up the road and 26 laps for him to find the time. 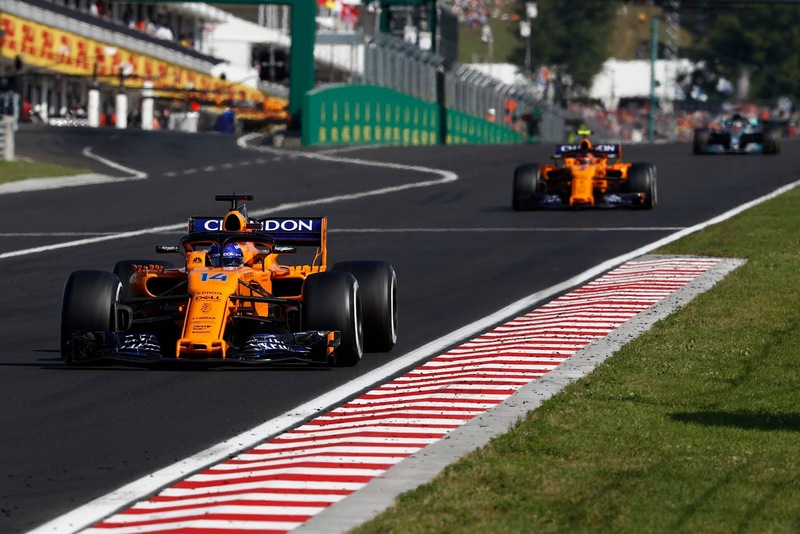 Alonso and Vandoorne, meanwhile had FINALLY pitted, and they were out P8 and P9 respectively, having gained several places by going long as Ocon held up their competition behind. The stop also promoted Kmag to P7 and the midfield was set for the run to the end. By lap 49, Hamilton had cleared the big mass of lapped traffic and was rolling in clear air, with the Bottas/Vettel group partway through and just approaching the McLaren duo. Grosjean had closed up to within 2 seconds of Sainz on lap 51 when disaster struck Mclaren. Vandoorne's car suddenly, and perhaps not unexpectedly, gave up the ghost and brought out the Virtual Safety Car. With a 10 plus second gap, Mercedes rolled out to the pitlane, but Hamilton went by without a second thought as the evidence on track indicated the risk wasn't worth the gain, given Vettel on brand new Ultras couldn't get by Bottas on ancient Softs. Bottas rolled by as well and the die was cast for the finale of the race. Hulkenberg was the only runner to try to take advantage, looking to make hay from P13 and rock by Ocon with fresh rubber. DRS for Vettel and small lockups from Bottas began to show the age of his tyres, but the Mercedes managed to grab DRS from lapped traffic and the battle was extended for another lap. Bottas was now beginning to seriously lose the rears, as Vettel kept the pressure up and the spectre of Raikkonen, who was continuing to close at more than a second a lap, was suddenly the other end of keeping Bottas out and not covering Ferrari's 2 stopper. Lap 64 and it continued to go sideways for Vettel, as he was still, frustratingly, unable to pierce the stout defense of the Finn. The following lap it all changed, as Bottas picked up some wheelspin out of T14 letting Vettel gain that precious extra tenth he needed for a serious effort. Down into T1 he went and around the outside as Bottas defended the inside line, but with better traction on braking thanks to his tyres Vettel then took the switchback into T2 as Bottas struggled with degradation induced understeer, up the inside and the move looked done. Bottas wasn't finished, though and as he tried to stick his nose up the inside into T3 and fight back, Vettel made a firm move to the apex that led the Mercedes to lock up and smash across Vettels rear, losing huge chunks of his front wing in the process. Remarkably, no puncture for Vettel and the contact also let Raikkonen by as well and put Bottas into serious danger from Ricciardo who was flying on his new tyres. 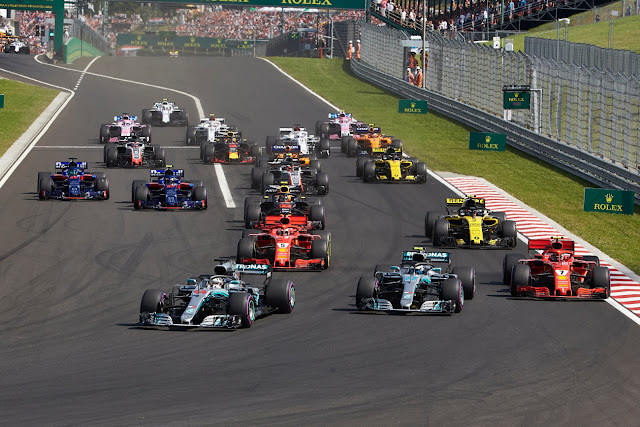 Taking the bit firmly into hand, as the last laps unspooled, Danny Rick managed to close the distance and a lap later he was the one making the move, again into T1 and this time, Bottas just whanged into Ricciardo with a massive understeer thanks to his mangled front wing. Ricciardo left ample room for an undamaged car, but at that point, Valterri's car was anything but. Adding some sauce to the mix, the stewards vowed to investigate the incident after the race (10 seconds and 2 points as it turned out, no change in the finishing order). At the front, Hamilton swanned blithely towards the checquers, his teammate's defense having created an unassailable gap for him. Mercedes meanwhile, told Bottas unequivocally that he needed to yield the position to Ricciardo, since the Red Bull had been sent wide from the contact in T1, allowing Valterri to maintain the position even though the Red Bull had the clear advantage. Bottas, not surprisingly, was firmly not with that plan, arguing that he was ahead of Ricciardo when the contact occurred. Regardless of the radio conversation on the final lap it was Ricciardo sailing by and taking P4 through final sector of the race... Hamilton, Vettel, Raikkonen, Ricciardo and then the wounded Bottas across the line then as the checquers flew and then the inspiring, and frankly, reasonably boring drive from Gasly for P6, followed by Magnussen, Alonso, Sainz and Grosjean. Happy days for McLaren to have such a strategically successful race, jumping about 4 cars from where they would've finished had they run a more conventional race, but sad days as Vandoorne looked to finish right behind them and given them a boost in the WCC, before his gearbox munched itself. Red Bull were in a similar state, with the catastrophic failure of Verstappen's PU weighing down the fantastic finish of Ricciardo. No definitive word as to the exact cause, but Red Bull were clearly all about blaming Renault for it. Disappointment for Sainz, whose race was effectively ended when Verstappen bulled him to the outside, costing him 4 places when all was said and done and leaving Kmag to effectively take his place. The retirement of Vandoorne let RoGro back into the points, meaning a fortunate double haul for the HAAS team after it all looked to have come undone when Grosjean's stop saw him stuck out of the points behind Sainz/Ocon. Bonus break for them as well, as they head off into the break a bit early, as they are skipping the upcoming test at the Hungaroring, unlike all the other teams. They are also up to P5 as it was a points free race for Force India, putting them down to P6, 7 points back as larger questions linger about their immediate future, namely, who their new owner will be and (natch) what the team will be named under new ownership. Tough to see Bottas down in P5 as he made a huge contribution to Mercedes/Hamilton's success in this one, but can't see that Merc had any choice but the one pit stop on L15 and then cross your fingers. A second stop wouldn't have been any better for the team of Bottas, so they had to hope the tires would hold out.